Larry Lefner works on "Humingbird Heaven". 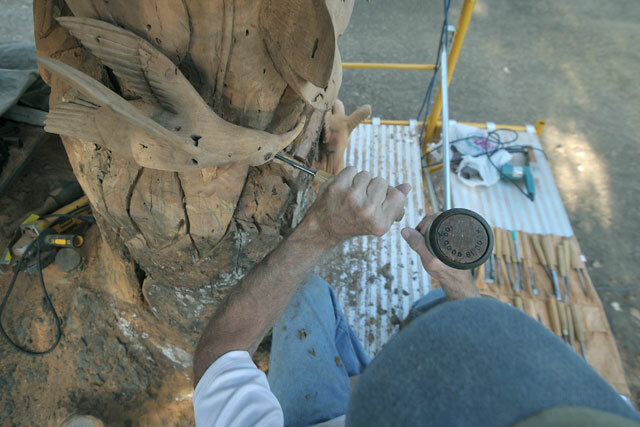 Larry Lefner has spent most of the past three months sitting in a sycamore tree in Montecito, tapping away at the wood with a rubber mallet and chisel. 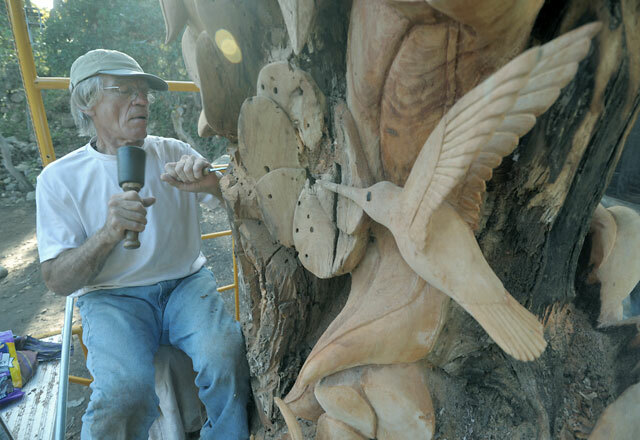 He’s working on “Hummingbird Haven,” a roughly 15-foot-tall wood sculpture commissioned by homeowners Gary and Lynn Hock after a large tree in their front yard died. 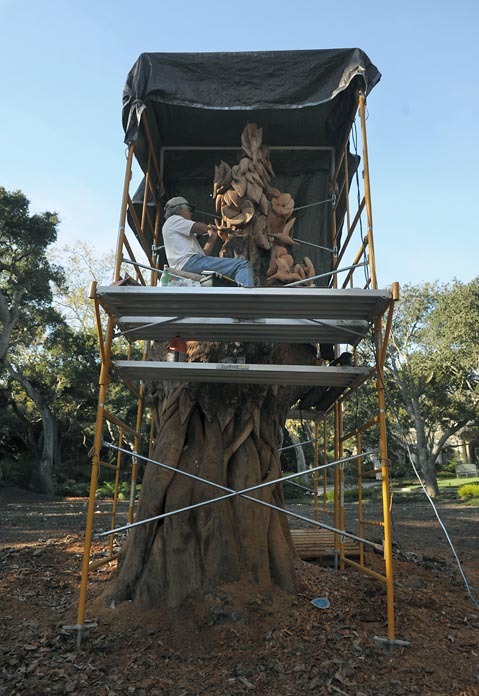 Rather than remove the majority of the tree, the Hocks called Lefner, one of the obscure medium’s best, to transform the stump into a unique work of art. 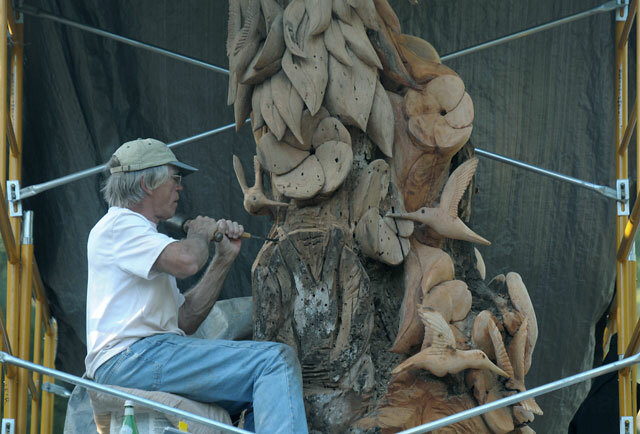 Though Lefner and his wife, Janna, have called the area home for around a year, Larry’s carvings and sculptures have been a part of communities from his native home of Garden Grove to the remote Woody Creek, Colorado. In Woody Creek, Lefner ran an art gallery nearby Hunter S. Thompson’s “Owl Farm” residence, managing as many as 35 artists and selling his sculptures. The current sculpture is Lefner’s largest, a towering construct of soft sycamore wood shaped by the artist’s mixed bag of tools, which range from small chainsaws to the fine edge of an X-acto knife. Lefner began carving at an early age, eventually whittling small tiki statues for neighborhood children while in his teens. After a stint at Santa Ana College, where he was named a first string All-American water polo player, Lefner studied at San Jose State, where he continued his artistic and athletic careers. After university, Lefner bounced around mountain communities in Aspen, Colorado, Sun Valley, Utah, and Santa Fe, New Mexico, where there was ample supply and demand for his artwork. Wood carving is no longer a widely prolific medium, and Lefner’s willingness to take on ambitious projects sets him apart. Hummingbird Haven is absolutely that, standing close to 15 feet tall with the delicate birds encircling it’s girth. But this is Lefner’s wheelhouse, the kind of large project he likes to dive right into, “one chip at a time,” as Janna said. “The bigger the better,” Lefner agreed. Lefner predicts the rest of the sculpture will take him another four months or so to complete, depending on whether he and the Hocks decide it should be stained or painted. He hopes to one day open a studio in Santa Barbara.